Get in on the Tuesday Tag- Along action and follow along! This is a great way to meet new blog friends! Follow the rules! If you stopping in from the Tuesday Tag Along then HOWDY! Leave a comment below that you are a new follower and the ways that you are following me. I follow back! On my right side bar I have Google Friend Connect, Facebook, Networked Blogs, Twitter and my RSS Feed. My current giveaways are on the top of my right side bar. I have more to list today and throughout the week. 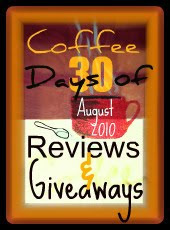 Starting August first I have a month long promotion to review and giveaway coffee and coffee products daily! So check back! Have a great day! Love your blog. Cookbooks are one of my little obsessions. I'm here from TTA. New Follower from TTA. Hope you'll come check out the chaos of being an army family raising a childhood stroke survivor and another kiddo who is bi-polar. Fun times at our house.